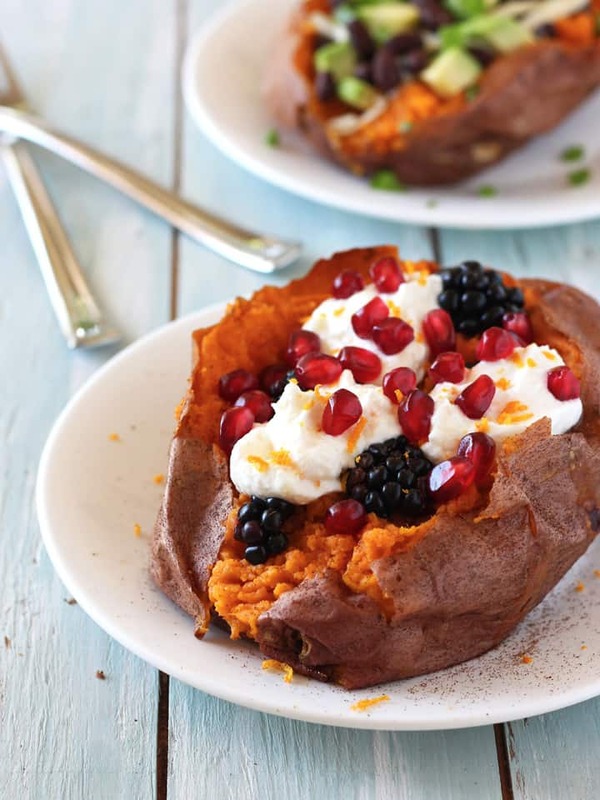 Make a meal in minutes with leftover toaster oven baked sweet potatoes 2 ways. Fresh fruit, crisp veggies, and healthy proteins will turn your plain spuds into a nutritious and satisfying meal that’s perfect for breakfast, lunch, or dinner. The kind of people who get their sweaters from the dresser and not a laundry basket because they actually put their clean clothes away. That couple at the store buying a full cart of groceries for their optimistic meal plan featuring 7 different recipes. It lasted for a solid two weeks but now the laundry’s still in the basket and the fridge is full of ingredients for recipes you don’t want to make. We’ve been there too, it’s a sucky feeling and to top it off you still gotta make dinner right? Fortunately, on Sunday night you cooked a few extra toaster oven baked sweet potatoes. Always a genius idea since you can refrigerate them for up to 5 days. So let’s grab the black beans, pepper jack cheese and avocado you bought for those pie-in-the-sky weekday enchiladas. Ricotta cheese for lasagna we both know is never going to happen. And might as well bring the blackberries earmarked for a fresh pie you are just dying to make after 10 hours at work. A quick pass by the condiments and you’re all set to whip up a pair of sweet and savory baked sweet potatoes. These overstuffed spuds are more of a Not-A-Recipe kind of recipe. A jumping off point for ingredients you might have on hand and fun flavor pairings to try. So don’t be afraid to substitute with what’s in your fridge. 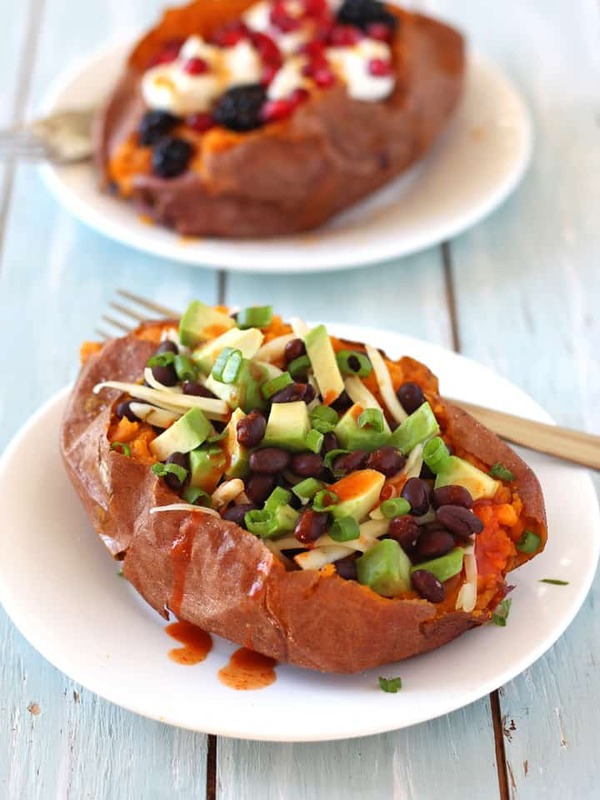 And a little secret, just between you and me…everything tastes great on a baked sweet potato. Cottage cheese, hummus, vegetarian chili and even pineapple. Seriously, you can take your fluffy orange spuds in any flavor direction you want and they will happily come along for the ride. In the end your meal planning didn’t go as expected but you still managed to create an awesome dinner so let’s put this one in the win column. Your Turn Guys: Share your secrets for rescuing an overly ambitious meal plan. Help the weary cook in all of us by leaving your best Not-Really-A-Recipe solutions in the comments below. Busy week? 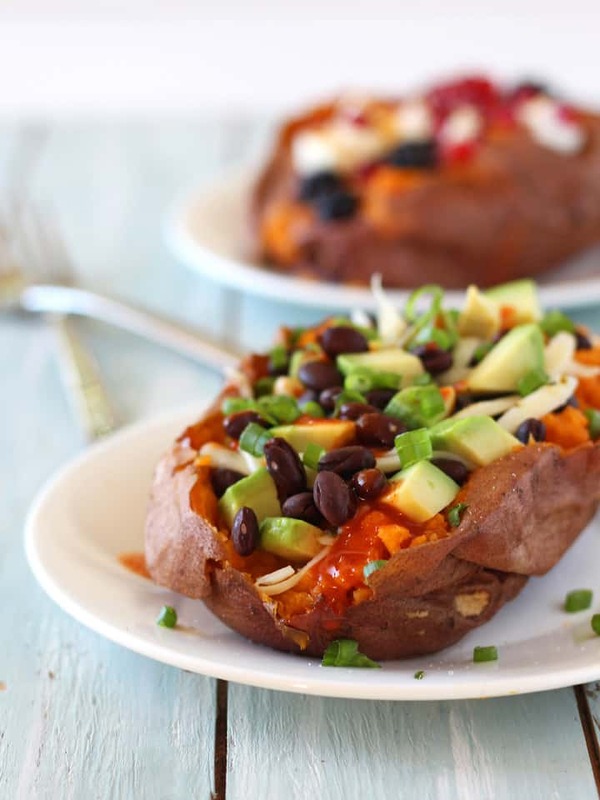 With a few fresh and hearty toppings turn a plain sweet potato into a high fiber, high protein well balanced meal. Slice open baked sweet potatoes, fluff flesh with a fork. Berry Ricotta Sweet Potato: Sprinkle flesh with cinnamon and fluff again to distribute seasoning. Stir together the ricotta and orange zest, dollop onto potato. Sprinkle ricotta with blackberries and pomegranate arils. Drizzle with maple syrup and enjoy. 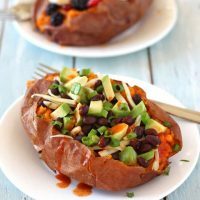 Spicy Black Bean Sweet Potato: Sprinkle flesh with salt and pepper. Fluff flesh again to distribute seasoning. 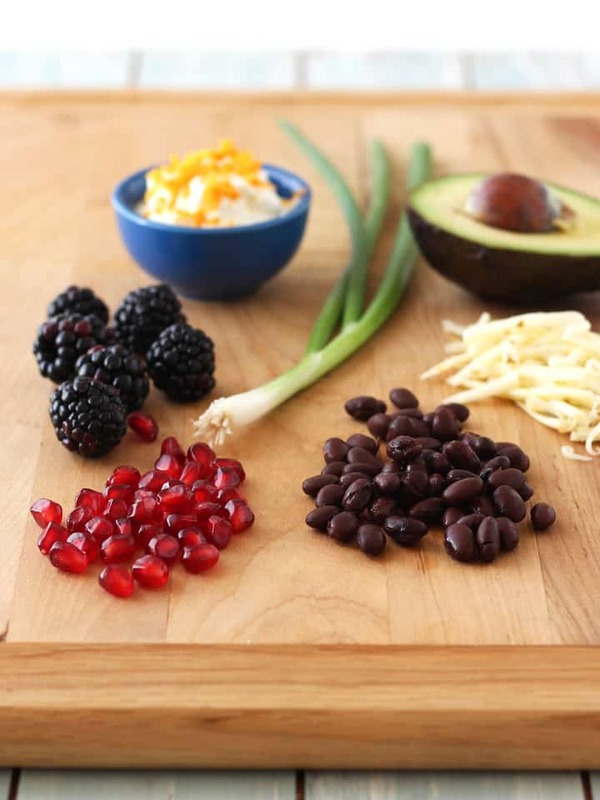 Top with 1 tablespoon of the shredded cheese, black beans and avocado. Sprinkle with remaining cheese and green onions. Drizzle with hot sauce and dig in. 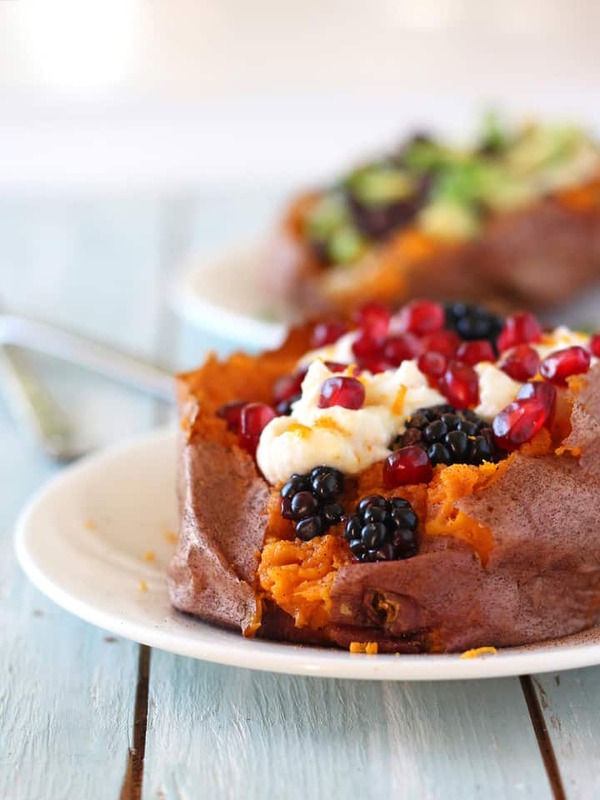 Nutritional information for each stuffed potatoes is using a 16oz baked sweet potato, to reduce calories/carbs in meal use a smaller sweet potato. Nutritional Information is an estimate for one Spicy Black Bean Sweet Potato.